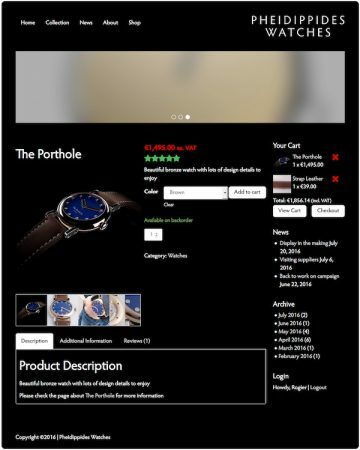 To accommodate your (future) wishes to buy one of my watches and accessories I am working on creating my own webshop. As many others have done before me, I am implementing wooCommerce on my WordPress website. An obvious and safe choice. Why reinvent the wheel or any part of it? Adapting the webshop pages to follow the styling of my website turned out not to be exactly that proverbial walk in the park. Most tweaks on the shop’s pages could (easily) be made in the layout plugin I use (Themler). Using this plugin I have also changed quite a bit of the out-of-the-box settings to turn the pages towards my taste and to the overall look-and-feel of my website. Some of the weirder issues that come along with using a standard plugin could only be solved using custom CSS (sorry for the tech talk, it just is). I am not too thrilled about that. My autistic view tells me it should not be necessary to override stuff that has settings in the markup tools. But then again, when it is not going as it should, it should go as it could. As this is out of my playing field, I have been calling upon and have had great help from Themler’s support desk. Kudos to them. 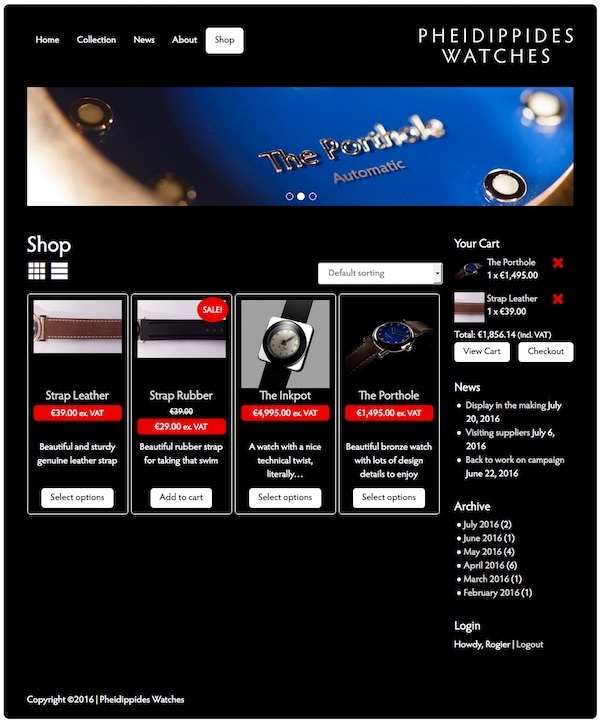 As we “speak” I have integrated the webshop into my website to a satisfactory level. It has the same look-and-feel as the rest of my website. Although there are still about 3 minor issues to solve I am pretty happy with the result. Themler support is working on it and they will no doubt solve them. By now you might wonder why the webshop is still not visible. As you know both crowd fund campaigns failed. As a result I have not been able to take the chance to build some stock of The Porthole. While working on model three, The Hourglass, I am puzzling how to finance the first production batch of each of the 3 watches. I need stock to fulfill orders. Are you willing to wait an unknown number of months it takes to fill a backorder list of 50 pieces? And then wait another 6 months worth of production before you finally receive your order? I guess not… I wouldn’t. But I have insufficient means to invest in building up stock for y’all. Until I have found a solution to this deadlock the webshop remains invisible to all you curious ones. Please see these sneak peek screenshots of the result so far.